Diet It Up: Pineapple Crunch Sundae: Who needs Red Mango? After many not-so-subtle hints, my Grandma bought me an ice cream maker for Christmas this year. My first attempt at homemade ice cream was a full fat, full sugar vanilla chunk recipe that turned out delicious. I knew ice cream was terribly bad for you, but when you pour the sugar and cream into the bowl yourself, it’s so much more obvious than when you scoop from a tub and choose to ignore the calories on the back. Ice cream, especially homemade, is a real treat once in a while. Whenever I’m on vacation, I find a way to sweet talk my husband into an ice cream sundae for lunch, topped with the works. But, frozen yogurt is a much more sensible alternative if you like to enjoy a cold dessert a little more often than the once-a-year family trip. The good news is, I LOVE frozen yogurt. I actually refer to the summer months as “fro-yo” season! My favorite fro-yo stop is Red Mango. The yogurt is all natural, it’s fat free, there are no artificial sweeteners and they have a huge variety of healthy toppings to add, from chopped nuts to fresh fruit. Red Mango isn’t trying to dress itself up and call itself ice cream. I love that. It tastes like tangy yogurt in frozen form. It’s creamy and completely refreshing without guilt. I would consider this little dish my take on turning a fruit and yogurt parfait into a dessert. 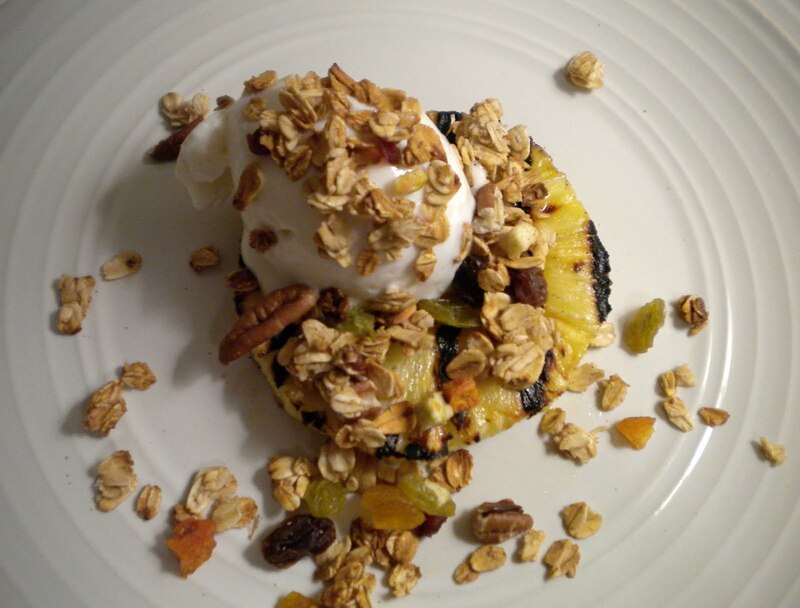 The Pineapple Crunch Sundae features TANGY VANILLA FROZEN YOGURT that I made at home in the trusty ice cream machine and it’s topped with my own TRULY HEALTHY GRANOLA. The grilled pineapple base is super simple. Just brush the fruit with olive oil and grill for about 5 minutes on each side until it’s nice and sweet. The yogurt is a salute to Red Mango. It’s literally just yogurt, a little sugar and vanilla. It’s tempting to go for fat-free yogurt. But in doing some research, I’ve found that commercial frozen yogurt vendors have access to food stabilizers and freezing equipment that the normal consumer does not. They can take a fat-free main ingredient and produce a creamy product. For us regular folks, I opted for 2% to make sure the yogurt had the right consistency and didn’t turn icy. The granola is my own creation. I spent a lot of time in the supermarket trying to find products that don’t contain high fructose corn syrup. That stuff is in everything! I don’t care what the corn industry’s cute little marketing campaigns are trying to convince us, it’s just bad for you. To make a very long story short, the fructose in corn syrup is not absorbed into the blood the same way sucrose, or table sugar is. It doesn’t trigger your body’s “I’m full!” response, so you’ll continue to feel hungry and consume more calories to make up for it. Welch’s does make a 100% juice concentrate that doesn’t contain any additives and Sun-maid brand dried fruits are made with just “fruit and sunshine” like the commercial claims. These products are found in the regular grocery store sitting right next to the corn-syrup culprits on the shelf. You just have to flip over the bag and read the label. If you aren’t into making your own yogurt or granola from scratch, you can still make the same dessert from store bought ingredients (I highly recommend Bear Naked Granola). You can change-up the fruit and flavors to your tastes. Sometimes it’s just as satisfying to skip the hot fudge and whipped cream. I've been craving for ice cream lately and this looks really wonderful. 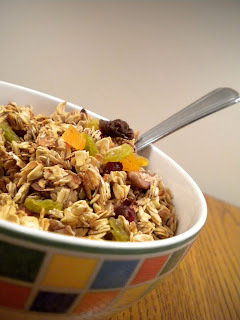 I love the chunky fruit and granola. The picture said it all, I tried this and my family loved it. Thanks for the idea of sharing this, what a nice twist for an ice cream. Vincent, thanks for checking out the site! 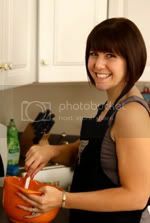 I'd love to be a part of petitchef.com. I just added your widget to my page. Pineapple sundae ranks very highly on the vegetarian menu. It is popular dish of American cuisine. I have made this granola recipe multiple times. It is simple and easy, and delicious with yogurt. Give it a try! Love your blog, and i just want to say that its very informative for me, looking forward for your next post.